These garlic chive buns are overflowing with umami flavor and delicious pork juices. Simply cook on the stovetop or fry and enjoy. 240g total (8 buns, 30g each). 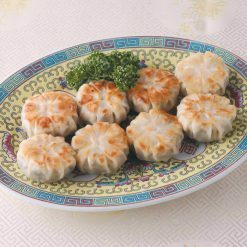 This item comprises of juicy and delicious manju-shaped versions of the popular round gyoza dumpling (gyoza are traditional meat or vegetable dumplings, and manju are a type of steamed bun). Coming to about 63 yen apiece, these buns are quite economically priced. Buns such as these make great snacks, appetizers, or side dishes, paired either with other traditional-style dishes or with modern fare. 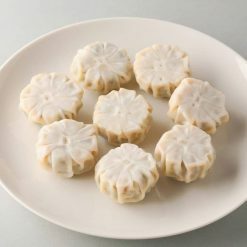 Making manju from scratch at home can be frustrating as well as prohibitively time-consuming, but Sugarlady’s frozen manju can be ready to eat in mere minutes; with very little prep or cleanup to worry about! Our goal is to make it easier for you to serve your favorite foods anytime, even on your busiest days. To cook on the stovetop: Heat 1 tablespoon of oil in a frying pan, then add the manju (still frozen). When they turn a nice fried color, add 80 to 100ml of water to the pan, cover with a lid and steam-bake. Lastly, remove the lid, dissipate the steam, and continue to fry the manju until their outsides become crunchy. Pair with vinegar-soy sauce, spicy Japanese mustard, or chili oil (or any sauce you prefer), and enjoy.To fry: Place the manju (still frozen) in cooking oil that has been heated to about 170℃, and fry for 3 to 4 minutes until they are cooked and heated all the way through. This product contains vegetables (garlic chives, cabbage, Welsh onions, garlic, ginger), pork, wrappers (wheat flour), soy sauce, sesame oil, yeast extract, table salt, rice wine for cooking, pepper.. 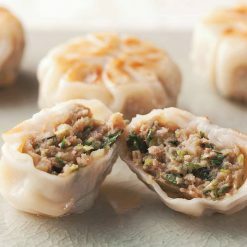 Origin of ingredients: garlic chives (China), cabbage/pork (domestic). Prepared and packaged in Japan.